Turmeric Orange Poppy Seed Dressing is tangy, slightly sweet and crunchy. You will feel an explosion of flavours in your mouth when you taste it. Perfect for fall salads! Plus, you can use the leftovers for smoothies. 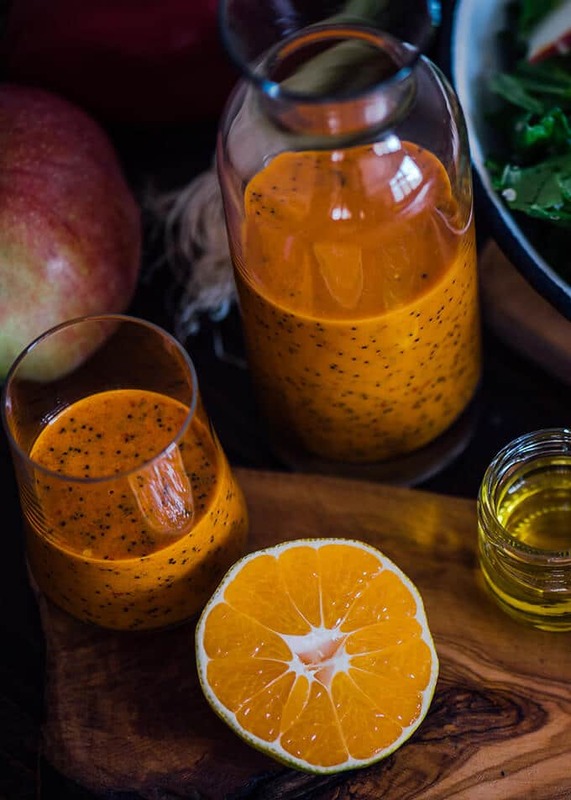 This Turmeric Orange Poppy Seed Dressing is like a revolution in our kitchen. There is a simple salad dressing that is common in Turkish cuisine: A mixture of lemon juice, vinegar and olive oil. Pomegranate molasses is a bonus if you have it on hand too. Depending on your taste, you can spice it with red pepper flakes, dried mint or thyme. We use it for any salad we make. So when I make this wonderful looking dressing, everyone in the house thought it is a kind of fruit juice mixture or a smoothie. They even asked me whether I was sure about pouring it over the protein packed salad I made that day. You know what? They wanted to taste the salad so badly right after I combined the salad with this beautiful looking orange poppy seed dressing. They had to wait though until we finished with the shooting. Lol! Waiting when food photography is in action. I know this is what people around us hate the most. So after the photography ended, they tasted the dressing itself. It wasn’t hard to understand how they were pleased but it was obvious that they were still suspicious about the salad with the dressing. When they tasted the crunchy green salad that is loaded with protein sources, they were absolutely amazed. And they started to ask what I put in the dressing. Oh and I will share the recipe for that salad soon if you are interested and looking for healthy salads for fall. They were definitely unaware of the turmeric until I told them. So this is a great way to ‘hide’ turmeric if you think it needs. I know several people who can’t eat it, so this recipe is for them. With the amazing ingredients inside, I think this is the best poppy seed dressing ever! The oranges I used were not too sweet. Everything was perfectly balanced. I used a combination of lime juice and orange juice. Plus one red bell pepper and two green onions. I decided to add turmeric when I wasn’t happy with the color. The red bell pepper made it too red but I wanted my dressing to have a beautiful orange color. Turmeric worked fine. I ended up with a scrumptious salad dressing with a wonderful look, which is extremely nutritious. Three birds with one stone. Is there an idiom like this in English? Turmeric Orange Poppy Seed Dressing is the first dressing I’ve made with our new blender and I know it won’t be the last. I can’t thank this small machine enough. We made several smoothies during summer with it. Probably Blackberry Fig Kefir Smoothie is the one we love the most. Turmeric Orange Poppy Seed Dressing is tangy, slightly sweet and crunchy. Put all ingredients except the poppy seeds into the blender and puree until smooth. Add the poppy seeds and stir with a spoon. Drizzle it over salads right before serving. Store it in an airtight jar in the refrigerator up to 2 days. You can use the leftover in smoothies. This dressing sounds absolutely lovely. I’ve been looking for more ways to incorporate turmeric! Thank you Brenda! Turmeric is great in dressings. Hope you have a chance to try this one. Do you used fresh or powdered turmeric? I used it in Black Bean Quinoa Salad but you can use it in any salad you like. Thank you! Adding cracked pepper is a brilliant idea! Such an amazing looking dressing, it really looks more like a smoothie than a dressing. I am totally into turmeric at the moment, so this is a must! Hi Adina, this has been my favorite dressing so far. 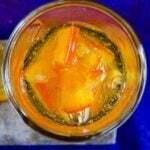 And turmeric is my current obsession, it is such a magical food with its color and health benefits for sure.